Falcone continues the era of stylish attire by continuing to make fashion clothes for men who care how they look in public. 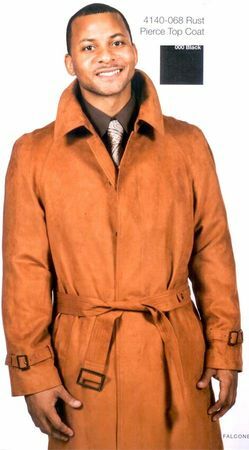 Their line of stylish looking trench coats made of micro suede continues their attention to fashion like few other long existing brands out there. This Rust Color Micro Suede Belted Trench Coat by Falcone is full length down to your calf and has a fancy looking paisley french faced lining that you will want to show off. Made of a soft Micro Suede material which will look great on you. If you like this style of trench coat, then you'll love all of these Mens Overcoats.